The poaching of Sumatran tiger in Kerinci Seblat National Park, Jambi, remains high as 120 tiger meshes to trap the large cat species were found and secured by the National Park Board. Head of Area II Kerinci Seblat National Park Board (TNKS), Dian Rusdianto said the tiger meshes were set by poachers to trap the tigers so that they could illegaly sell the animals. The traps, however, not only pose serious threat for the sumatran tigers population but also other protected animals in the national park, Rusdianto who is also a field director of sumatran tiger preservation program (PHS) in TNKS said. “We have sent three suspects of tiger poaching for legal process. Two of them are village heads in Merangin and a civilian,” Dian Rusdianto said . 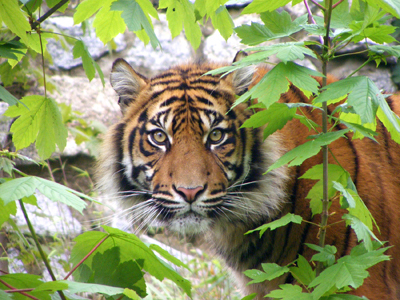 The Kerinci Seblat has the most sumatran tiger population than other national parks in Indonesia. Data from 2011 census shows there are 165 tigers live in the national park. However, the threats come not only from the poaching and illegal traps. The 1.4 million-hectares national park is threatened by encroachment of the protected forest area. Thus, the natural habitat of sumatran tigers and the other protected animals, including the tigers’ prey, is diminishing. However, sumatran tigers could survive better than the javanese one-horned rhinoceros in term of diminishing habitat. “Actually, the most important thing is to preserve the tigers’ preys as the big cat can breed in almost every (environment) condition provided the preys are still available and preserved,” Rusdianto said, adding that the one-horned rhino, in other hand, needed a naturally preserved habitat to breed. The shrinking natural habitat would also lead to conflicts between human and animal. “There are some conflicts between tigers or even bears and human. Those might be caused by the damaged natural ecosystem,” Rusdianto said.